It's Facebook Fridays for March 16, 2018 -- and if you have ever wanted to learn how to make your own conjure altar where you can burn candles, cast spells, or connect with your ancestors, we are here to help! This week the Lucky Mojo Curio Company is holding a random drawing to give away 4 spiritual supply prizes to our friends and followers on Facebook. 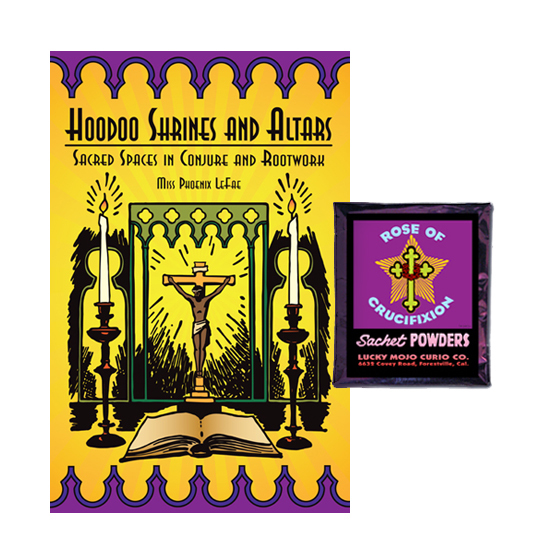 Each lucky winner will receive a copy of Miss Phoenix LeFae's superb instructional work, "Hoodoo Shrines and Altars," plus a packet of hand-made, sweetly scented, Lucky Mojo brand Rose of Crucifixion Sachet Powders to create a home altar space and bring the power of the Rosy Cross to your magical workings. First thing tomorrow morning, we will select FOUR winners at random, announce their names here, and ask them to message this Facebook Page with their mailing addresses, so we can send them their FREE "Hoodoo Shrines and Altars" book and Rose of Crucifixion powders. Thanks for uploading this contest announcement. We have a winner! In fact, we have 4 lucky winners! Our Facebook Fridays! winners for March 16, 2018 are: Jess Wilson, Darrin W. Owens, Tonja Marshall, and Danni Anni.